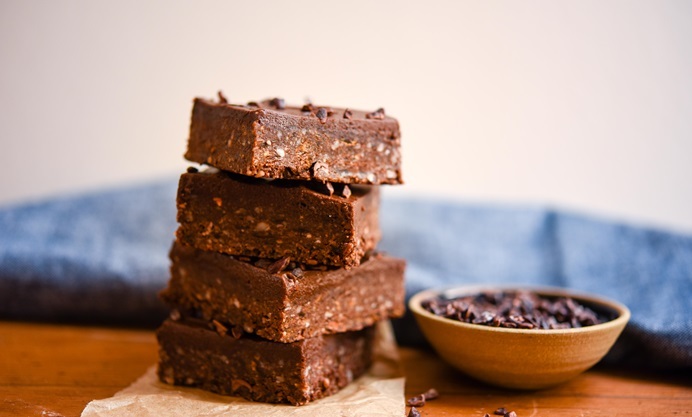 This frosted raw vegan brownie recipe packs a punch thanks to vitamin-packed cacao powder and nibs. The peanut butter frosting adds a glorious richness, while the nutty, sticky brownie base will satisfy a sweet craving for any chocolate lover. 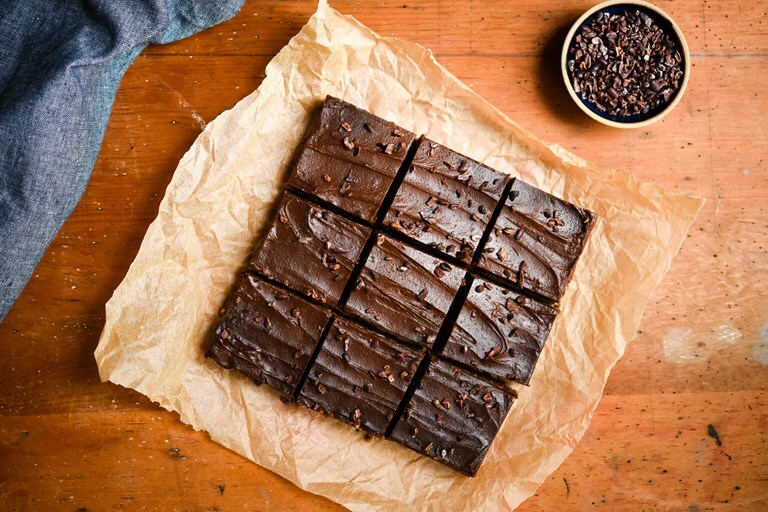 For those times when you have a real sweet craving, but you don’t want the crash that comes with really sugary treats, these no-bake brownies are perfect. The combination of non-alkalised cacao powder, dried fruit, nuts and cacao nibs satisfies your sweet tooth, and they’re good for you. Cacao powder is full of antioxidants, magnesium, flavanols and iron, these all help to maintain the health of your heart, immune system and reduce the risk of age-related illness. These brownies are so easy to make as no cooking is involved, you just need to blitz all of the ingredients in a food processor and leave them to set for a few hours. These are a great energy boost before exercise, or perfect to take on long walks. They are dairy-free and gluten-free so they are a treat you can enjoy and share with friends that might have any specific dietary requirements. In her spare time, Angela develops recipes for her blog Patisserie Makes Perfect and indulges in her passion for photography. As the name would suggest, she has a keen interest in patisserie and strives to use the best possible ingredients and classical techniques throughout her work.